near as more and more have being asking, “What would you like for Wintersday?”. “I want a quaggan plushie” said one youngster who loves the cuteness of the quaggans. would you like for Wintersday? gifts you receive this Wintersday, please don’t forget to give something back. is the prologue to a multi-stage narrative called Flame & Frost. you need to play with your American or European friends, it’s time to switch server! From the 28th and forward server transfers are going to have a gem cost. of the Silent Storm map. they are adding that as well! Infusions as well as some new kinds of Ascended Amulets. full list of whats in the update can be found here. rewards to better suit what you would want as a reward. which gives the world of Tyria that much more of a living ever changing world feel. apprise adventurers of the events currently happening in the world of Tyria. can use the new guesting system. While weâ€™re amidst all the fun and festivities of Dragon Bash and the event of the Effigy Lighting Ceremony happening later today in Guild Wars 2, ArenaNet, as always, is making this world event even cooler for its fans with some fun, musical extras available for our viewingâ€“ and listeningâ€“ pleasures. If youâ€™ve been finding that the Dragon Bash theme song is stuck in your head throughout the day, you can also enjoy it in multiple forms online. For some nifty behind-the-scenes information on the songâ€™s origin and a video about its production, fans can check out this developer blog. Additionally, you can even download and listen to four of the musical tracks from the event on ArenaNetâ€™s SoundCloud page. A mysterious message will send you to seek out private investigator Marjory Delaqua in the Dead End, a bar in the Eastern Commons of Divinityâ€™s Reach. After her cinematic introduction, head back to Lionâ€™s Arch to investigate. All of the story instances will be single-player. A message from Marjory indicates that three of the suspects have been located. The ogre Vorrk in Lionâ€™s Arch, the quaggan Morraloo in Bloodtide Coast and the skritt Kasparak in Gendarran Fields. Talk to Investigator Kiel in the Grand Piazza to enter the Scene of the Crime, a single-player instance. After a scene between Marjory and Kiel, talk to Marjory to obtain an Investigation Kit. With the help of the kit, youâ€™ll be able to exonerate five of the murder suspects. Upon finding Vorrkâ€™s body, use the Investigation Kit to collect arcane residue evidence. Morraloo and Kasparak are found alive; you should be able to talk them into returning to Lionâ€™s Arch for investigation. 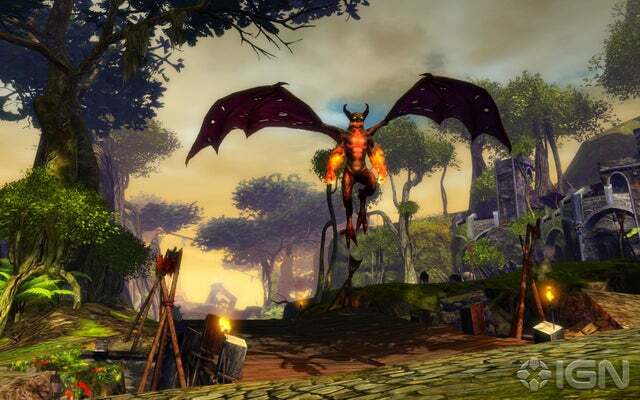 On June 25th, Guild Wars 2 will leap headway into a brand new world event: Sky Pirates of Tyria. It seems thereâ€™s a criminal on the loose, and along with Inspector Ellen Kiel, it will be our job to help track down this dangerous criminal and reap the rewards. Pirates always have treasure. To find that treasure, you can take part in the new, secret story dungeon by the name of Aetherblade Retreat, enjoy a scavenger hunt and new jumping puzzle, and track down Aetherblade Caches, which are, of course, hidden around Tyria by the pirates themselves. Weâ€™ll also see a handful of new features in the update, including some upcoming skill and trait changes that are outlined in this developer blog. For more details on this awesome-sounding event as well as screenshots, read all about Sky Pirates of Tyria here. discovering the Aetherbladesâ€™ secret headquarters and bringing these killers to justice. information, his journey can be followed in the Sea of Sorrows novel. projectors across Tyria. Approach them with caution. jumping puzzle in the Mists. Retreat mini-dungeon and the appearance of the Aetherblade Caches. to complete 12 of 20 of the previous achievements. forward, that three week cycle is set to ramp up to every fortnight. weeks), it doesnâ€™t really need one. Q: Are there any Hero features that we haven’t seen previewed yet? Phinney: Yes. We were really happy with the response we saw to Heroes in the Nightfall World Preview Event, but the event, and our own testing since then, gave us some ideas for improvements. And, of course, there were a few things that werenâ€™t quite ready to show during the event. For one thing, each Hero comes with three different armor looks that you can unlock, so players will have a chance to choose a look that they like best. Weâ€™ve also worked a lot on improving Hero AI and refining the controls for Heroes. Heroes are much better now at intelligently managing their Energy to make them better for everyone, and for you control-freaks out there (you know who you are), weâ€™ve added the ability to disable AI for an individual skill. Once you disable the AI for a skill, a Hero wonâ€™t use it unless specifically told to do so by you. This can be especially handy for skills like Traps and Spirits, which can require a little extra foresight for determining where and when to use them. You can turn the AI for each skill on and off independently during missions. Another really big aspect of Heroes is the ability to use them in PvP. Heroes can be unlocked for use by PvP characters either by recruiting them during the roleplaying campaign (just like skills are unlocked when you learn them by playing through the roleplaying content) or by spending faction at a Priest of Balthazar. Once a Hero is unlocked for PvP, a level 20 version of that Hero becomes available for all of your PvP-only characters to use. Q: Heroes are a big addition to the cooperative game. 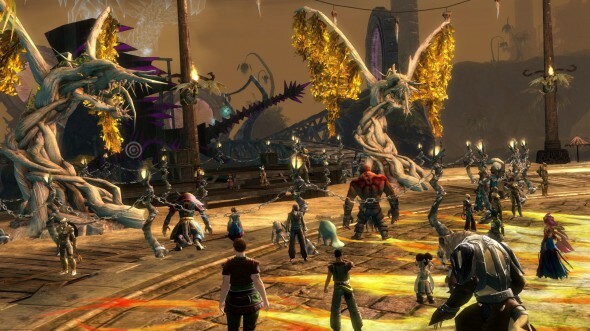 Are there major PvP features in Guild Wars Nightfall? Phinney: We mean for Heroes to be a big addition to PvP as well, and are currently working on a new type of PvP called Hero Battles. Weâ€™ve tried to design a game type that’s fast and furious, has tactical and strategic depth, and is fun to watch. We’re extremely happy with what weâ€™ve seen so far. Part of our goal was to make it so players didnâ€™t have to delete and remake PvP characters so often, so weâ€™re also adding a â€œPvP Equipment Builder.â€ You can use this Equipment Builder whenever youâ€™re in an outpost with a PvP-only character and make any item you could make during PvP character creation. Unlocked a new rune at the Priest of Balthazar? You can immediately make yourself some armor with that rune in it. Want four full weapon sets? No problem. 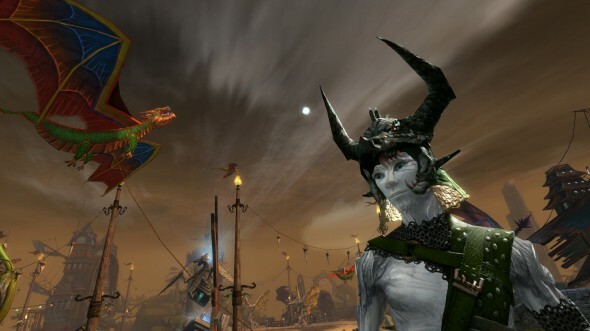 But Hero Battles arenâ€™t the only new feature that Nightfall is bringing to Guild Wars PvP. Character templates will be a really big improvement. Youâ€™ll be able to quickly save and load whole skill/attribute/profession set-ups for you and your Heroes with this feature. As everyone who played the preview event knows, youâ€™ll be able to change your secondary profession quickly any time youâ€™re in an outpost. And for everyone out there who likes to play a little GvG, weâ€™ve upgraded Observer Mode to include recent GvG battles by your guild. Weâ€™re hoping this will really help players develop their skills in GvGâ€¦plus itâ€™s cool to be able to watch a replay of yourself.